Vanderbilt-Ingram Cancer Center Health Educator Claudia Barajas, Sem. Juan Garcia of the Roman Catholic Diocese of Nashville, Meharry-Vanderbilt Alliance Program Manager Jacquelyn Favours, MPH, CPH, CHES and Vanderbilt-Ingram Cancer Center Health Educator Angelica Deaton at the Faith and Health Collaborative’s Breakfast with Pastors. NASHVILLE, Tenn. Nearly 50 faith leaders from at least 20 Latino churches gathered at the Coleman Park Community Center on July 14, 2018, for the Faith and Health Collaborative’s Breakfast with Pastors. The assemblage – organized by the Meharry-Vanderbilt Alliance (MVA), Vanderbilt Ingram Cancer Center (VICC) and Faith and Health Collaborative – hoped to gain insight and feedback regarding health needs in the community. “The goal was to establish a culture of wellness within diverse, faith-based congregations and communities by engaging with the metropolitan faith-based community through outreach, networking and capacity-building,” Claudia P. Barajas, Health Educator from VICC and Keynote Speaker at the event, explained. 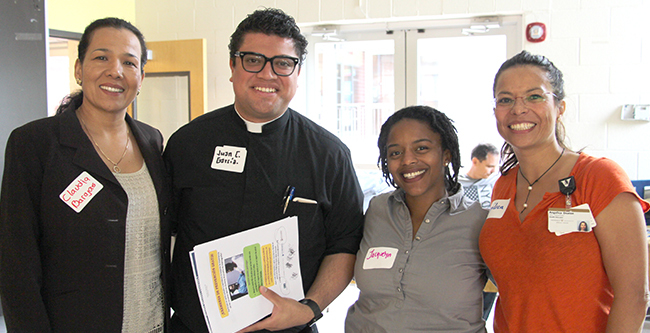 Guests at the event were faith leaders from throughout the Latino community in and around Nashville. Representatives from the Sexual Assault Center, Camino Seguro, Regional Intervention Program (RIP) Centerstone, VICC, the Safety Net Consortium’s My Healthcare Home and the Tennessee Immigrant and Refugee Rights Coalition (TRRC). Participants discussed cancer prevention information, opportunities for early detection screenings, mental health resources and more during one-hour table discussions. Some of the faith leaders in attendance also voiced concerns about Latino mental health and fear that immigrant communities have to access services and even to miss work to get preventative health check ups because of the current political climate. Important issues such as domestic violence go unreported because of fear in the community. The event, held entirely in Spanish, was a first of its kind by the MVA. Organizers hope to hold ongoing meetings that support the needs of both congregations and the community, and that address the capacity of the faith community to address health. Founded in 1999, the Alliance bridges the institutions of Meharry Medical College and Vanderbilt University Medical Center. Its mission is to enrich learning and advance clinical research in three primary areas -- community engagement, interprofessional education and research -- by developing and supporting mutually beneficial partnerships between Meharry Medical College, Vanderbilt University Medical Center and the communities they serve. Through community engagement, the Alliance serves a large community of stakeholders including surrounding universities and colleges, community organizations, faith-based outlets and community health centers. Its interprofessional education enhances students' interdisciplinary understanding and improves patient outcomes through integrated care. The research conducted provides access to experienced grant writers and materials supporting the grant application process and facilitates grant-writing workshop.